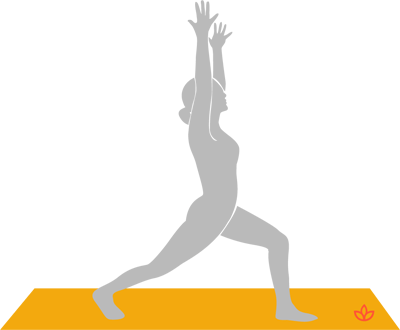 What is High Lunge Pose? High lunge pose, or utthita ashwa sanchalanasana in Sanskrit, is a beginner's standing posture that builds strength and stamina. It's similar to but more accessible than warrior I as the back heel is lifted and the arms are parallel rather than touching. Begin in standing forward bend with the fingers on the floor beside the feet. Exhale and step the right foot far back. Rest on the ball of the right foot. Inhale and lift the arms and torso, reaching the hands toward the sky. Align the front knee over the ankle and bring the torso vertical. Exhale and step back to standing forward bend. Change sides.